Common in story-telling, particularly in television, is the desire to start anew: wipe the slate clean and generate novel ideas from a fresh perspective. 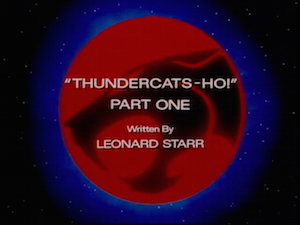 Leonard Starr, who penned the series’ first four episodes and is generally credited—along with Jules Bass—with establishing the world of the first season, does just that in “ThunderCats Ho!”. Starr first toyed with longer story arcs in the Anointment Trials, but “ThunderCats Ho!” is the first of four week-long five-part adventures that would become a trend: in 1987, 1988, and 1989, a game-changing five-parter would launch the newest batch of semi-serialized episodes. But it all started in 1986 with this, “The Movie”. Starr’s tabula rasa is sparked by first flashing back to the beginning. 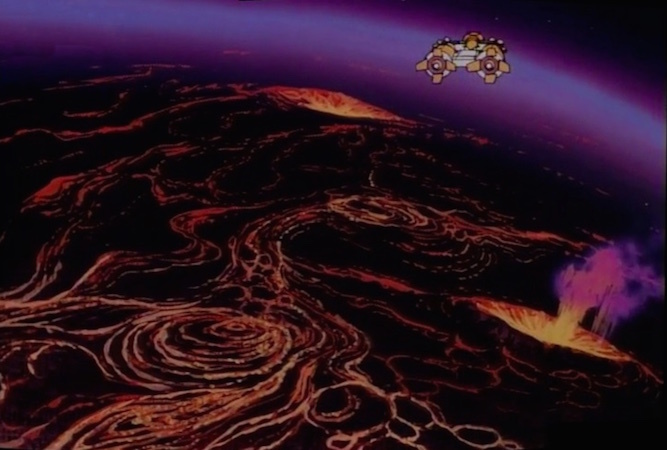 We get to see the destruction of Thundera from the ground, and it’s far more chaotic and harrowing than any prior depiction. 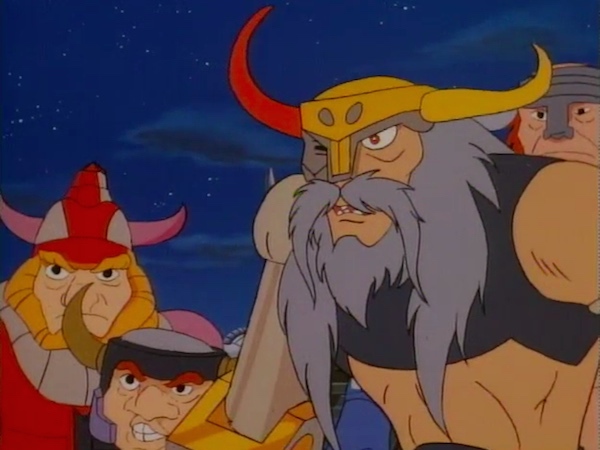 Where “Exodus” failed in making the end of Thundera an impactful or terrifying moment, “ThunderCats Ho!” does much better. 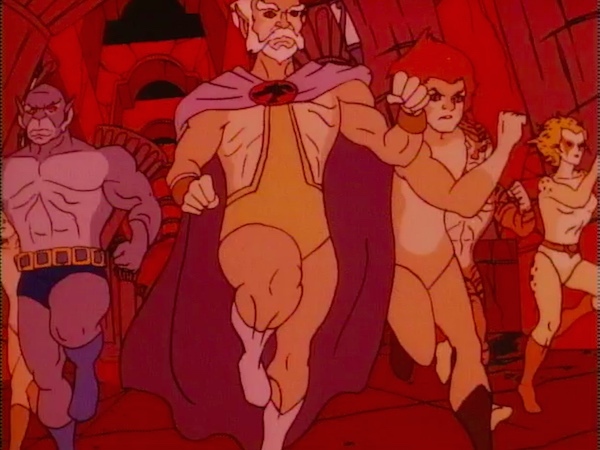 We see the original Cats’ Lair, far grander than its Third Earth successor, falling to pieces as the ThunderCats rush to their ship. 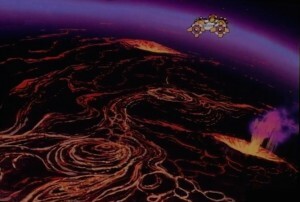 Worse, we see many other ships being destroyed before they can even launch, and we hear the pain in Lion-O and Lynx-O’s voices as they mourn their fallen countrymen whom they cannot save. This—the selfless duty one has to one’s friends—is the driving theme of the entire five-parter, and Starr does a great job of weaving it in without it feeling saccharine or overstated. 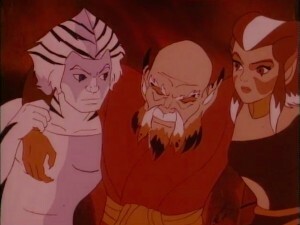 As far as the ThunderCats know, Lynx-O, Bengali, and Pumyra are Thundera’s only other survivors, and the ‘Cats immediately set to work to rescue them. There is no debate, no question in their minds. Panthro even has a momentary freak-out when he learns they are Hammerhand’s prisoners. Likewise, Bengali and Pumyra refuse to leave Lynx-O behind after his blinding, even lying to him so that he won’t blame himself for slowing them down. The Thunderians also show a remarkable esteem for the ThunderCats, and pride in their heritage. 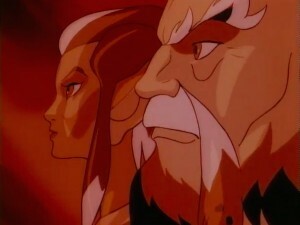 When they accept their doom on Thundera, for instance, they take solace in the fact that the ThunderCats and the Code of Thundera will have survived. That’s mighty big of them. Not only does Starr introduce three new Thunderians, including the blind warrior Lynx-O. 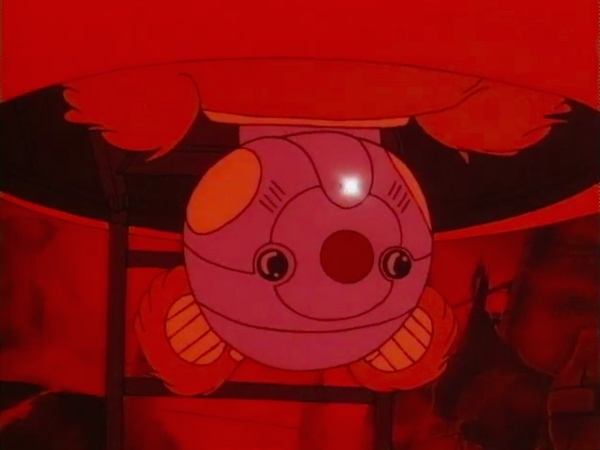 He also creates Ma-Mutt as an ally and emissary for Mumm-Ra, reinvents Hammerhand and gives him an entirely new crew, and teases two new vehicles for the ThunderCats. Starr has confessed that this was all purely commercial: there was a desire to expand the toy line, and so he delivered. While this commercial aspect is sometimes tangible (e.g. forgetting the existence of the Feliner in favor of new vehicles), Starr redeems himself through ample and enjoyable characterization. We immediately get a feel for Lynx-O, Bengali, and Pumyra as individuals. The Berserkers are an enjoyable bunch also, each unique in ability and character. Even Hammerhand is more interesting this time than in his previous incarnations. While the quality of animation would vary over the five parts of this series, the first installment is very well done. The flashback sequences are excellent, with impressive lighting effects, some striking backgrounds, and a lot happening in frame without a loss of quality. 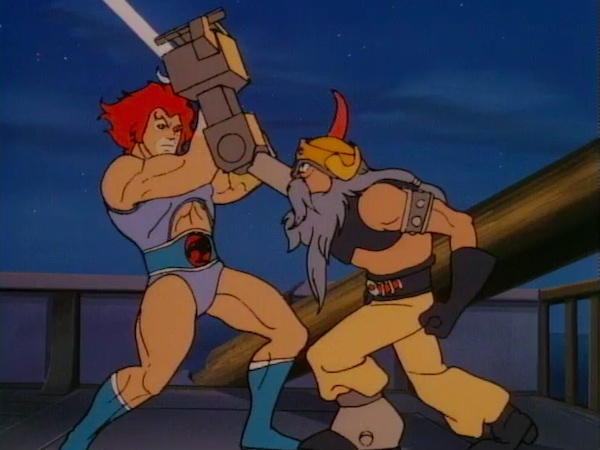 The scene of Lion-O aboard Hammerhand’s ship is also great, from the moment he puts the Sword of Omens to his face through to the end of the battle. This scene features the first of several new cues from composer Bernard Hoffer, and is truly exhilarating. 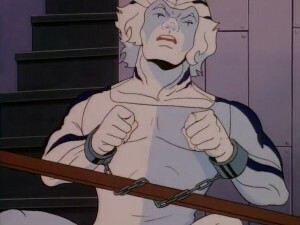 The cutaway to Bengali, straining against his chains in an effort to help Lion-O, is particularly effective—one of the episode’s best moments of writing, animation, and music working perfectly together. There are some big questions raised in Part One that are never answered, and which suggest that Starr may have been writing in a vacuum. 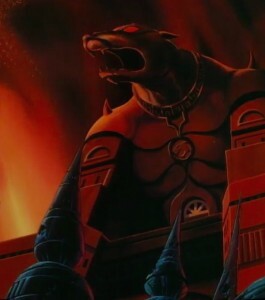 For instance, it’s an odd coincidence that the only three Thunderians Lion-O remembers seeing perish happen to be the only three survivors rescued by the passing Berbils, who happen to also be destined for Third Earth where after travelling for millions of light years they happen to run out of fuel miles short of their destination. Likewise, it is not explained how Jaga only now came to learn of their presence on Third Earth, nor how long they’ve been there, nor how they managed not to age without suspension capsules. 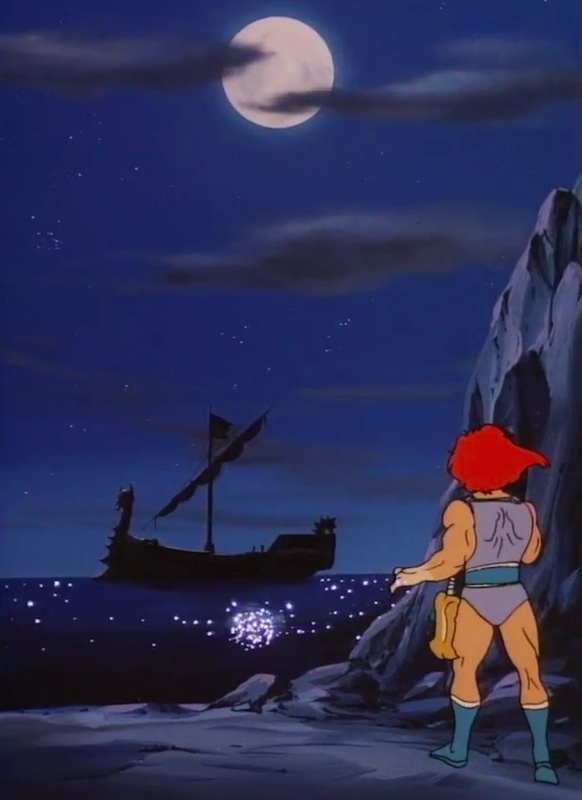 Another mystery is how Lion-O goes from being so distraught as they flee Thundera to peacefully asleep in his Flagship bedroom in “Exodus”. And who are these fishermen who live in villages and have large boats? 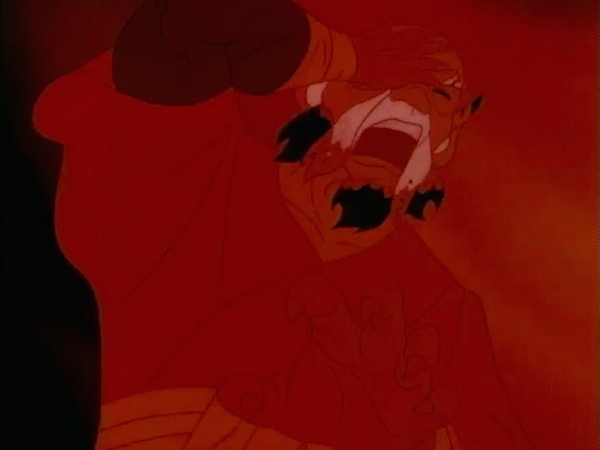 Didn’t Hammerhand-as-Panthro smash all the fishing boats?! All joking aside, none of these questions or plot-holes really detract from the viewing experience. “ThunderCats Ho! Part One” succeeds in injecting new energy into the series, and sets the pace and tone for the next four episodes. The importance and star-power of this five-parter cannot be overstated, but Leonard Starr should be applauded for pulling it off with aplomb—it’s much more than the sum of its parts. 1 ^ Leonard Starr gave each part a working title. Part One’s was “The New Thunderians”. 3 ^ Chrichton, David. Hear the Roar. Denbighshire: Telos Publishing, 2011. 315. 4 ^ In a line cut from the final version, Pumyra says that they’ve been on the island for years. Perhaps they got to Third Earth before the Flagship, and the lack of aging during the voyage can be chalked up to relativistic effects. 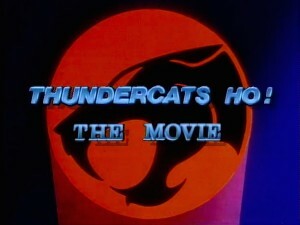 A standalone movie version of “ThunderCats Ho!” was released on home video in international markets and may also have aired on television as a two-hour movie. This version was edited differently, with some scenes truncated or missing altogether. In Part One, these edits included the removal of the Thunderians and Berbils discussing the Berserker ship as it approaches, as well as most of the storming of the beach. This eliminates all weaponry from the island, and makes the Thunderians seem mostly defenseless. Jaga tells Lion-O that, one day, as Lord of the ThunderCats, he will have to make many hard decisions. But in “Exodus”, Jaga tells Lion-O that he is the Lord of the ThunderCats. Perhaps somewhere in the intervening time, Jaga gives up hope that Claudis has survived. RoBear Bert and Bob mention that the Berbils must emigrate from Planet RoBear because it is tiny. This implies either dwindling resources or Berbil reproduction. Oh my! 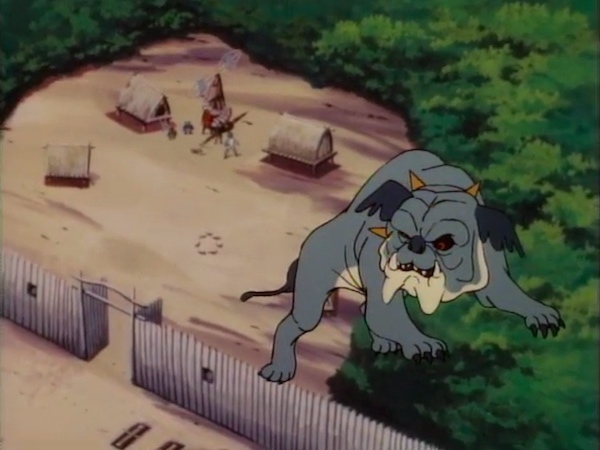 In a draft of the script, it is not Panthro but Jaga who rescues Lion-O inside the crumbling Lair. He then picks him up and carries him to safety. This same script also features Snarf gobbling up Lion-O’s breakfast after he refuses it, Tygra defending Cheetara against Lion-O and the ThunderKittens’ demands that she use her gift, Ma-Mutt using echolocation to find the island, Cruncher squeezing a basket of melons until they explode, and Bengali and Pumyra urging Lion-O not to surrender on their account. Leonard Starr wrote a comical “optional sequence” in which the Berserkers discover the Berbils’ culinary skills and then fire their cook. Literally. They hoist him onto the rail, and then Ram-Bam hurtles into him, launching him over the horizon.